The Comprehensive District Improvement Plan provides goals and strategies for the journey ahead. While pleased to be designated the top district in Kentucky by Niche.com recently, Fort Thomas Independent Schools personnel are already looking ahead to the future. Kentucky schools traditionally have received strong direction on school performance goals and measurements, but changes and new models of assessment will be coming into play. 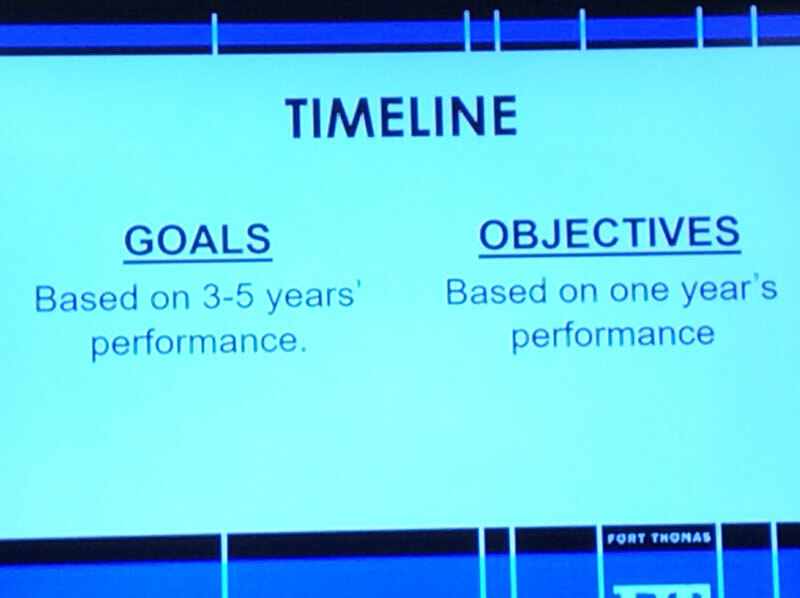 Fort Thomas administrators decided not to wait, but to develop their own strategy and goals for the next few years. Assistant Superintendent Bill Bradford and principals from each of the district schools met to develop a three-year plan and to identify strategies that will bring the district closer to those goals in the coming school year. The result is the Comprehensive District Improvement Plan presented at the January school board meeting. Bradford praised the efforts of those involved saying it is a compilation of the hard work on all of the individual schools’ improvement plans. Admittedly aggressive, the goals were developed through historical analysis of district growth over the past three years. 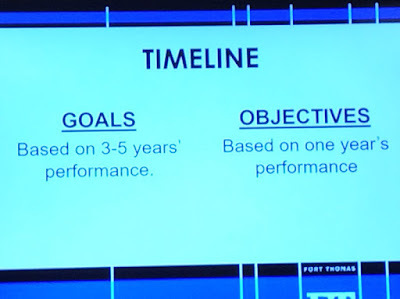 The administrators developed a formula to construct the goals using regression analysis, Bradford explained. The administrators identified an initial five goals for the three-year period but will add a few more in years two and three. The first five goals are Proficiency, Gap, Graduation Rate (high school only), Growth (elementary and middle schools only) and Transition Readiness. They plan to later add an Opportunity and Awareness goal and expand the Growth goal to the high school level. Each goal is for three years, the year 2020. Along with these goals, the group developed objectives for where they want to be at the end of this school year and listed out strategies for achievement. The Proficiency goal is to increase the combined (reading and math) percentage of proficient/distinguished students to 89.7 percent for elementary school, 82.6 percent for middle school and 74 percent for high school by 2020. One year from now, the objectives are to bring reading up to 80.04 percent and math to 76.24 percent for all schools combined. Under this overarching goal, the group identified strategies and activities they will target that will help meet this year’s objective. Some of these include alignment of curriculum, monitoring of systems, deconstruction of academic standards and looking at curricular delivery methods. In discussing the list of strategies, Bradford said "These are threads that are embedded in each of our levels from Johnson Elementary to Highlands High School as commitments on behalf of the administration and teachers. And so, we have in essence adopted those as well." For elementary and middle schools, progress can be measured through state assessments, and ACT scores will be used for high school. The Gap goal is to increase the average combined reading and math proficiency rates for all students in the "Gap Group" (non-duplicated) to 58.42 percent for elementary, 64.95 percent for middle and 54.75 percent for high school. A Gap Group, according to education experts, generally refers to the disparity in academic performance and achievement between groups of students. In an effort to close these gaps, the objectives for this year are to bring proficiency rates for students in the Gap Group to 54.3 percent in reading and 46.7 percent in math. "It is a high-level expectation, but it is one we will achieve," said Bradford. Many of the strategies for this goal involve how schools handle "response to intervention" or Rti, an approach to early identification and support of students with learning and behavior needs. Some of the strategies include developing a protocol for RTI instructional needs, clearly defining the Rti structure and process, using data-centered decision making and documenting student movement. Work in this area already is underway, especially at the elementary school level, added Bradford. "We have invested in programs to be able monitor and also apply academic acceleration for students." Identifying a goal for graduation rate was difficult, said Bradford, because Highlands High School already achieves a remarkably high rate. Yet, he said, it’s good to have a goal in which to aim. The Graduation Rate goal is to increase from 98 percent to 98.1 percent by 2020. Strategies include assisting students in decision making, having common expectations for students to be college or career ready; monitoring of individual student progress; effective communication to support students, parents and guardians; and work toward addressing any barriers to learning. The Growth goal for now only covers elementary and middle schools. Administrators plan to add growth goals for high school later. The goal for 2020 is to increase in the average of combined reading and math growth from 75.4 to 86.3 percent for students in grades four and five and from 79.15 to 82.15 percent for students in grades six through eight. Objectives overall for the coming year are to increase growth of reading to 81.14 percent and of math to 76.18 percent. "For our Growth Goal, we are referring to the students' annual categorical growth. Our intent is to increase the number of students moving from one performance level (novice, apprentice, proficient, or distinguished) to a higher level, as well as sustain the number remaining at the proficient and distinguished levels," explained Bradford. The goal would be to help students in the distinguished category retain their position and to help other students increase category. Strategies are to aim for a high level of student engagement, to use high-yield instructional strategies and to analyze student data to better understand where students are and where they are going. The Transition Readiness goal is a new and somewhat unique goal, said Bradford. The goal is to increase the percentage of students who are transition ready from 75 to 81.33 percent for elementary, 58.2 to 66.15 percent for middle school and from 86 to 90 percent for high school students. The district is in a position to identify the measures for transition readiness, so the administrators chose a set of specific objectives for the year ahead. The first objective is to increase the percentage of students who are kindergarten ready to 77.1 percent. For high school students, the objective is to achieve 87.3 percent for college and career readiness. At the middle school level, the group decided to focus on writing, said Bradford, because proficiency levels for that school were not as strong relative to that of students at the high school level. For students in the eighth grade, the objective is to have 60.5 percent of students achieve proficiency in writing. Strategies include improved communication and engagement for community members, explicit writing instruction across all content areas, a system of collaboration among teachers, student ownership and involvement in decision making, progress monitoring and assessments. The district plan will be subject to changes coming from the state, and adjustments may need to be made, but Bradford says he is confident the plan provides the basis of a workable road map for the journey ahead.